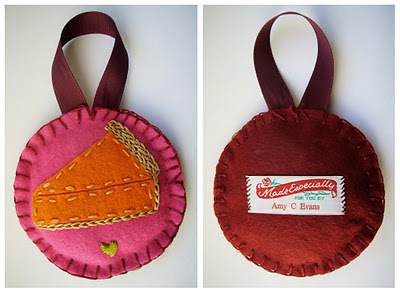 Check out these adorable felt pie ornaments made by Amy Evans Streeter. Streeter is an artist living in Oxford, Mississippi who has a great love for pie, as evidenced by her paintings and numerous pie-themed posts on her blog, Made In Mississippi. She is also making these ornaments with red and lavender backgrounds, and if you contact her, she might just sell you some! Thanks for the pie love!!!!! !